Is The PSP Go Dead Yet? This is the last picture I took of my PSP Go before selling it on eBay for $200. Is anyone still holding onto theirs? Three months after Sony released the UMD-less, sliding screen PSP Go I finally caved and bought one of my very own. Why? For one, it is a very pretty device. It's gorgeous, really, all compact and sleek and slide-able. The other reason was I figured it was easier for publishers to send me reviewable titles via a PlayStation Network code than UMD disc, so it wouldn't matter that I couldn't use them. Cut to four months later, and I've received at least three or four preview builds for upcoming PSP titles on UMD. My favorite games from the PSP's past aren't available for purchase, and I still have a drawer nearly filled with UMD titles I can't play. It's still extremely pretty, but the PSP Go is nearly useless to me. It's not like Sony is supporting the device either. Every new PSP game ad focuses on the PSP-3000 model of the system. One of the biggest PSP games of the system's history, Metal Gear Solid: Peace Walker, is coming out soon, with a limited-edition PSP-3000 bundle and nothing for the PSP Go whatsoever. Everyone knows the system has failed. I know. Sony knows. Hell, even GameStop knows. The video game retailer will still sell you a new PSP Go for $250, but when I checked to see how much I could get towards a PSP-3000 by trading the more expensive system in, I was shocked to learn that the PSP Go is only worth $50 to GameStop. Which led me to eBay. 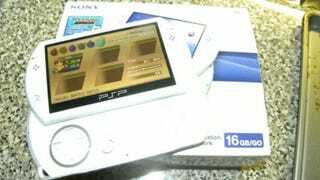 The PSP Go still sells relatively well on the auction site, perhaps due to the preponderance of impulse buyers cruising the categories for a good deal. I set the "buy it now" price to $200, posted my auction, and the next morning I had $200 in my PayPal account and a trip to the post office to make. So at least one market for the PSP Go is still strong. Though I can't help but wonder when my system's new owner will realize that the system he's purchased is exactly the same as the PSP-3000, only it slides, can't accept UMD drives, and has a slightly larger memory capacity than the older model with a 16GB Memory Stick Pro. It's been said before, and I'll say it again: the PSP Go is no better than a broken PSP-3000 with a fresh new look. So mine is gone now, the new owner seems pleased, and next weekend I'm picking up a new PSP-3000, hopefully one of those pretty lilac if I can find an extra Hannah Montana bundle lurking about Walmart. Sure, it's packaged with a Hannah Montana movie and video game, but hey, at least the system will be able to play them. Are there any PSP Go faithful still among us?